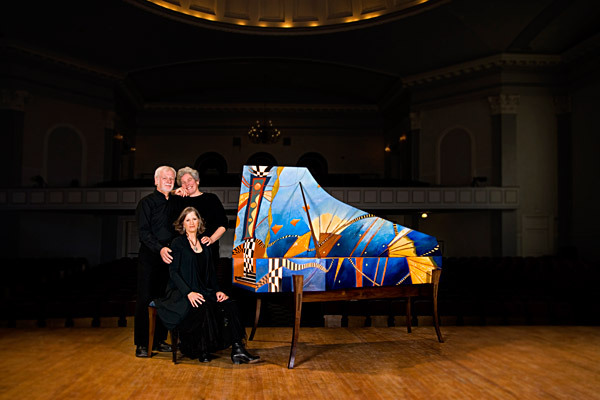 Kingston’s 333rd instrument was built for Elaine Funaro, specialist in new music for harpsichord and artistic director of the Aliénor*, a nonprofit organization which encourages modern compositions for harpsichord. 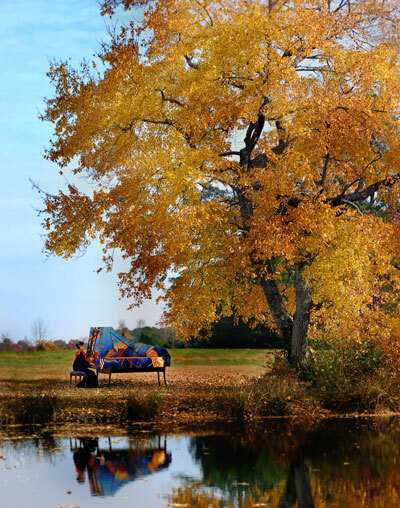 It is a standard model that he has been building for the last 2 9 years, a departure from the harpsichords modeled on Parisian instruments that he built before 1978. 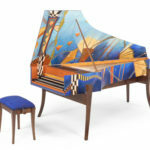 Kingston says his first challenge was to free the instrument from all preconceived notions of what a harpsichord should or should not be visually. 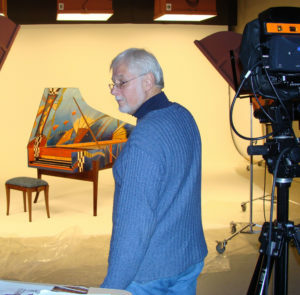 He believes that though modern harpsichord makers have the responsibility to remain honest to the design and materials of the historic instruments, they must also extend the instrument’s limits to the farthest horizons that modern composers dare to take them. Opus #333 is 18th-century northern European in all aspects of its design, though the action is most certainly 18th-century French as to octave span, key length, shape, and balance points. The total coupled weight, without pluck at the lower keys, is 35 grams and the individual keys of each manual are precision balanced. The disposition is 2x8, 1x4, hand stops, shove coupler, with a compass of FF-g3,three-position transposition. A buff is supplied on separate battens for each 8-foot set, one conventionally operated for the hand stop in the key well, and the other from a knob at the batten on the bass end of the pin block. The pads of the back batten reach diagonally across the near batten to engage the strings close to the nut. The transposition set-up, compass and octave span of the 6 7/16 inches at the gap produce the width of 41 inches at the key well. The 105 inch case length is primarily the result of scale. The c2 is 15 inches and just scaling goes from the top of the compass to the tenor range before foreshortening begins. The depth of the case is 11 inches, with a large opening between the header and the first lower frame. The header features an additional member mortised on its anterior side and perpendicular to the header. This piece functions as a “stiffener” to the header. Two upper frames are glued to this piece and divide the length of the header into thirds. Thus, with gap spacers in place the line of stress from the bent side to the pin block is unified. The four-foot hitch pin rail is considered part of the case, and is installed prior to the case receiving its soundboard. The soundboard is made of spruce with tapering from 5/32 inches to 3/32 inches overall and conventional ribs of sugar pine finely feathered at each end and overlapping the spine liner. The bridges and hitch pin rails are made from Pennsylvania black walnut. The back pinning and side draft of the strings are typical, although the elevated position of the hitch pin rail is considerably less than the height of the corresponding part of the bridge. The downward force of the strings is offset by the upward thrust of the crown. The crown is affected by means of a cant on the eight-foot, bent side liner that is seven degrees at its peak. The pin block is Appalachian white oak, three-piece laminate with a grain orientation of two opposed to one, the centerpiece being odd to the outside planks. No veneer is applied. The case is basswood, except the bent side interior frames and liners, which are yellow poplar, from the Appalachian region. The liners, header and frames, are cut to have a grain orientation of 45 degrees to the perpendicular surface, providing straight grain on all sides. Since the composer of modern pieces asks the audience to hear new sounds, Kingston believes it is fitting that the instrument be void of design elements which could evoke expectations of historical music. 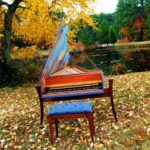 With this in mind, he designed the Opus #333 levers, hinges, and stand to function the same as classically designed instruments, but also to stand apart visually from all other harpsichords, classic or modern. His design incorporates the repeating concept of sets of threes, along with the illusion of the freedom of movement in every direction. Blacksmith Ben Frisby of Marshall, North Carolina, created the unusual hand forged hinges that Kingston designed. 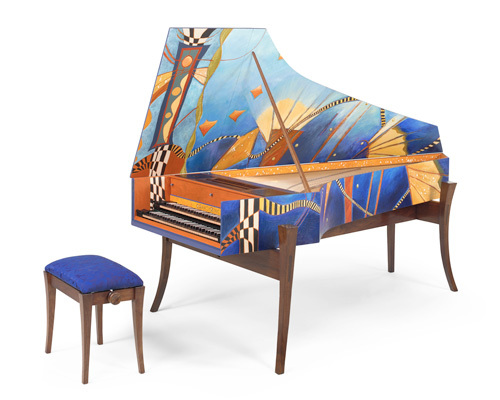 Early on, Kingston felt that the instrument itself should be considered a work of art and that the stand should cradle it, as a way to present the art. It was also important that the stand not be influenced by 17th- and 18th- century furniture. 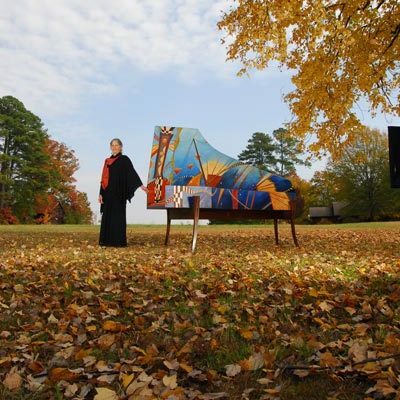 He presented his design to master furniture builder Douglas Carlisle of Mooresboro, North Carolina, who specializes in working with unusual woods and shapes. The stand/cradle was made from Pennsylvanian black walnut and is a work of art separate from the instrument it holds. Its legs curve in two planes, simultaneously angling out and curving forward, and the sides of the stretchers and crossbeam are both convex. 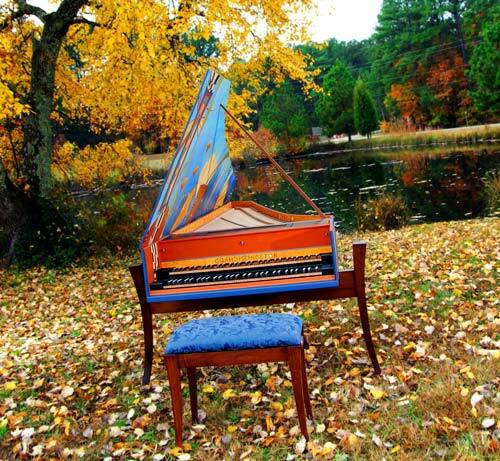 Additionally, Carlisle created the harpsichord’s matching bench. Kingston asked glass artist Alex Greenwood, from the Ashville (North Carolina) Center for Glass to create the three nontraditional glass ends of the handstops for the Kingston Opus #333. 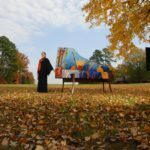 Artist Lisa Creed of Durham, North Carolina, painted the lid with an abstract representation which flows beyond its boundaries onto the case. On the left side of the lid is an icon representing the composers score and the performers realization with resultant emanations of sound. The Kingston Opus #333 was debuted during a three concert series, Back to Bach and Beyond: Redefining the Harpsichord, presented by Aliénor on November 12, 13 and 14, 2009 in Durham, Chapel Hill and Raleigh, North Carolina. This series featured concertos by J.S. 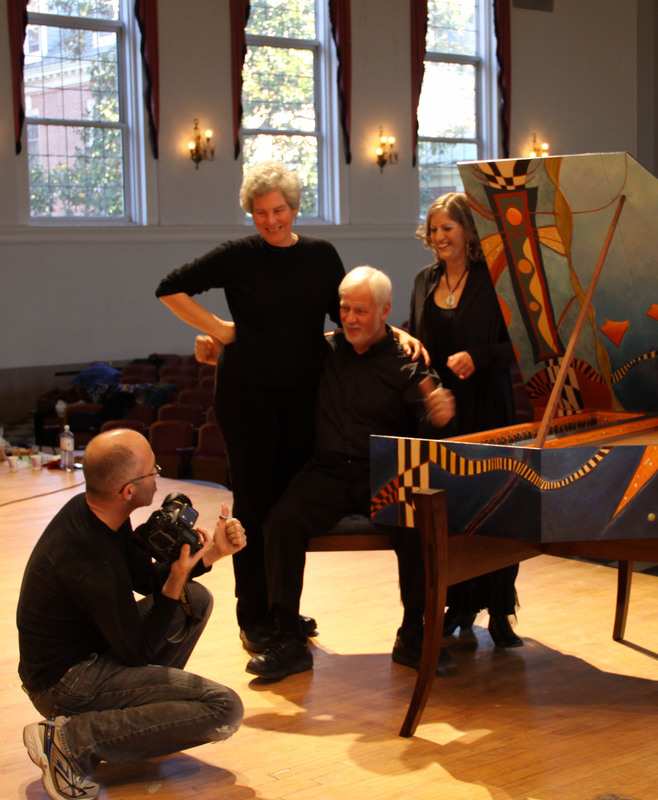 Bach for one, two and three harpsichords, played by Elaine Funaro and Beverly Biggs of Durham and Rebecca Pechefsky of New York. 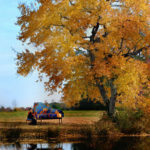 Also showcased were the sonatas for two and three harpsichords by Aliénor winning composer Edwin McLean of Chapel Hill. 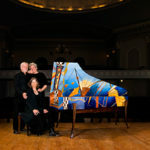 After the concerts, Funaro led a brief discussion about her new harpsichord with McLean, Creed and Kingston on stage, to answer questions from the audience. THE STORY OF OPUS #333 – Video, "Birth of a Harpsichord"